He was one of the greatest boxers of all time—and we loved those 7UP commercials he did with his son in the late ‘70s—but the personable Sugar Ray Leonard had some dark secrets. In his new autobiography, The Big Fight: My Life In and Out of the Ring (written with Michael Arkush), Leonard reveals being sexually abused as a child, cheating on his first wife, and becoming a drug addict. Leonard also details the many great fights of his long career—from his 1976 Olympic gold medal in Montreal to his Las Vegas extravaganzas against the likes of Tommy Hearns and Marvin Hagler. Leonard writes engagingly about his preparation for each fight and provides the ultimate insider view of the boxing world. We caught up with the champ, who has lived on the Westside for more than two decades, and asked him about his book. It was a very emotionally challenging journey. I found myself being very vulnerable and very transparent and very open, and I never thought that I would be able to reveal things that I kept so close to my heart. In the book, you talk about having almost a split personality—there’s “Ray Leonard,” the person you were outside the ring, and “Sugar Ray,” the boxer. Can you describe the difference? Ray Leonard is somewhat quiet, almost introverted, very nice, and very reserved, very non-confrontational. But to be a boxer you have to be very committed, and that became Sugar Ray—a guy who believed in himself. It was crazy because they were both me, but one existed in the ring and one existed outside the ring. Outside of the ring I’m nothing like I was in the ring, with confidence with self-esteem. Plus, I was sad outside the ring. In the ring, I was so elated, energized. Of all the big fights of your career—against Roberto Duran, Tommy Hearns, Marvin Hagler—what were some of your favorite moments to write about? And what were some of the most difficult? Without question [defeating] Tommy Hearns in 1981 was a major and defining moment in my boxing career. But then again, Marvin Hagler [in 1987] because of beating the odds. Forget about whether or not they said I deserved the decision [against Hagler], it was a great accomplishment. Years ago, I would never have been so open about my losses—to Terry Norris [in 1991] and Hector Comacho [in 1997]. Those were just two fights in which Ray Leonard stepped into the ring. It wasn’t Sugar Ray, it was Ray Leonard, who was so distraught over his first failed marriage. I was using boxing to kind of direct my attention to something else. It wasn’t too smart. We have to ask about Dancing with the Stars this season. What was that experience like? That was one of the most challenging experiences in my life. I’ve never been as nervous. I didn’t realize I said yes to be on the show until they announced the cast. And it’s hard, ballroom dancing. I’m glad I had my partner, Anna Trebunskaya, because she walked me through this whole process of learning ballroom dancing. It was fun. But now, the kids see me and they stop and say, “Hey, Sugar Ray, we loved you on Dancing with the Stars.” I get all these kisses from women. It’s not a bad thing. A lot of people know me from dancing, and not boxing. We understand you’ll be taking on an important new role this month—Honorary Mayor of Pacific Palisades. I called my mom and said, “Mom, listen I am mayor of Pacific Palisades.” She said, “Oh my god, do you have security?” It’s a wonderful honor. 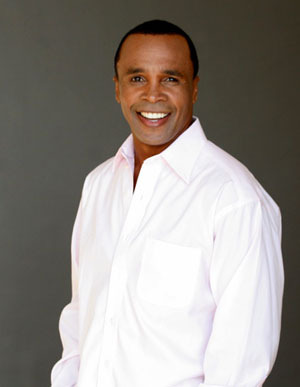 You can catch Sugar Ray Leonard in a book event at the Barnes & Noble at The Grove tonight at 7.